Plants face 60 ton behemoth and certain death!! The days were growing colder and the garden was quiet. The plants were in their late fall slumber mode when the call came. 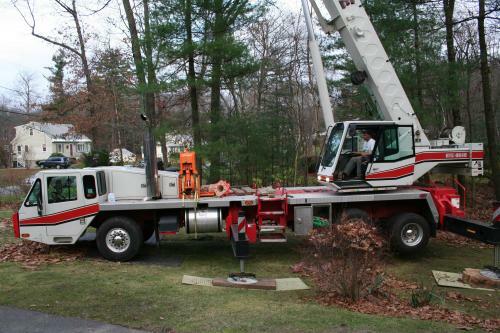 "Hello, Mr. Sullivan, this is the tree service". 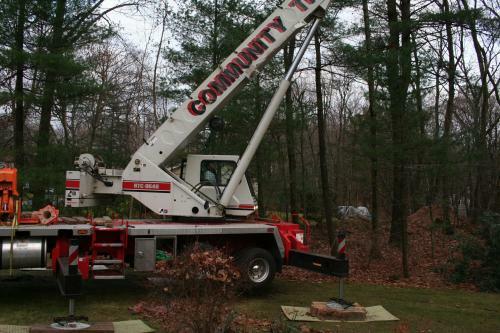 I had called them earlier in fall to have them remove several trees including a 100+ ft white pine. "We will be there on the 19th". I hung up the phone and glanced into the yard. While I had moved a flower bed that was blocking access to the tree, I had still had to remove a couple of yucca filamentosa. 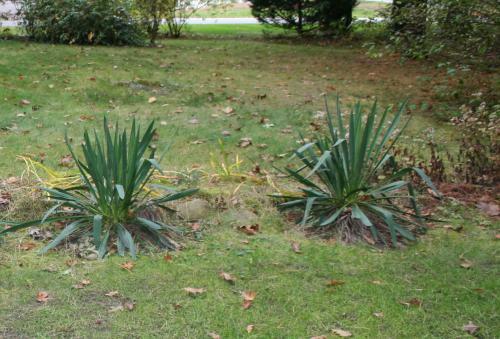 The yuccas had a long pedigree having been originally planted in 1905 by my grandmother at the family summer home. After my folks passed I removed several bushes and plants including the yuccas to my home. They now stood in the way of the crane that would remove the giant pine. I unlocked the toolshed and grabbed a shovel. I was not thrilled to unearth the yuccas so late in the season but a 60 ton crane, no matter how cautious the preparations, makes a deep lasting impression. Thirty years of living in the same spot lends to lots of roots and the two plants in question were very happy plants. Grudgingly the yuccas yielded to the shovel and because they were too heavy to lift, were dragged away in a tarp to a prepared hole. 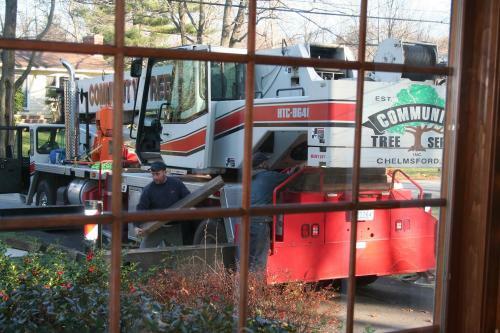 True to their word the tree people with two cranes appeared in our driveway mid morning prepared for the day's work. Preparations to minimize the damage to the lawn by 60 tons of steel did little to appease the plants watching the unfolding events from the sidelines. Bushes trembled as the giant passed them on its way to do battle with the doomed pine. 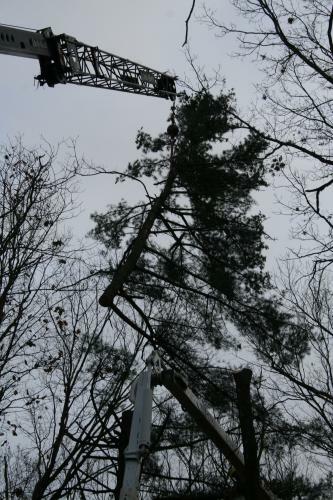 The larger crane set up camp 60 feet from the targeted pine. The Queen of hearts in Alice in Wonderland could not have said it better, "OFF WITH IT'S HEAD!!" The giant crane lifted the severed conifer's top over the onlooking plants and spectators, its 180 year reign had come to an end. 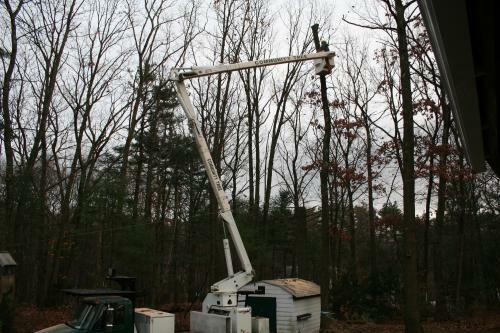 The threat of falling during a hurricane ended by the stroke of the woodsman's chainsaw. In a corner of the yard two very unhappy yuccas spent the winter. The spring could not come fast enough. For one spring never came, however, several pups survived the winter to take its parents place in the old vacant hole. The other plant weathered the cold season, surviving but with a diminished capacity, it was glad to soak up the springtime warmth back in its old home. A bonus of severed roots is that the old hole now has 19 more yuccas of varying sizes and a volunteer (from seed) has taken up residence within sight of the new young yucca. It will take a few years for the new and transplanted Yucca to gain/regain a respectable stature but time is on their side. As long as the leviathans stay away. I love the way you can make a story out of anything.